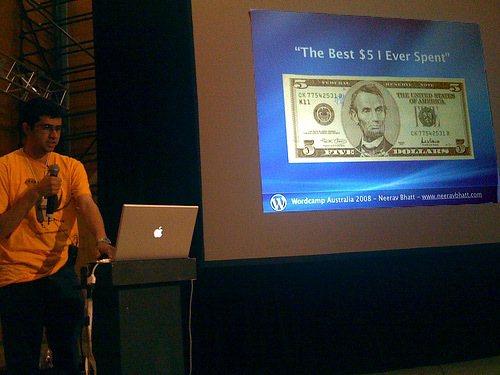 Last weekend I attended Wordcamp Australia 2008 where I made a short presentation about the opportunities that have opened up for me as a result of using WordPress as my blogging system including becoming a professional blogger earning a sizable income from my blogs and associated activities. There were plenty of interesting presentations and people I chatted with but going to Wordcamp Australia 2008 was worth it for 1 reason alone, to saw thanks to Matt Mullenweg for making WordPress such a great free piece of software because without it I wouldn’t be where I am today. Thanks for your presentation Neerav, I was really impressed with all the speakers at WordCamp. I hope to see you again at a WordCamp event in the future. WordPress is amazing I run my blog with them. I would donate $10!!! I have only used 2 types of blogware and I have to say wordpress is the one I use. Ok I will admit it I have never made any money with my blog, but I am toying with the idea. liked your presentation but where is the sound??? The Best to you! I just started blogging for fun on blogspot. Maybe i should switch to wordpress. I could use some extra cash these days. Previous PostPrevious Simple Savings.com.au Reviewed – Will it Help Australians Save Money?